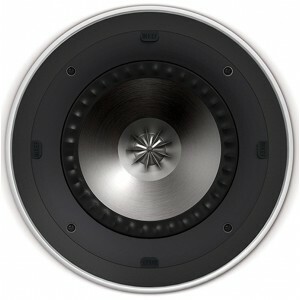 KEF Ci200RR features a 1.5" tweeter voice coil, vented aluminium dome and woofer with Z-flex surround. The KEF Ci200RR-THX is a THX certified in wall/in ceiling speaker that has passed THX rigorous testing standards, making it one of the best sounding options you can buy. This model features a 1.5” tweeter voice coil that combines with the vented aluminium dome with tangerine waveguide and a woofer with a considerable magnet and Z-flex surround. The LCR in-ceiling speaker holds the ability to deliver an enchanting musical theatre experience in even the largest of rooms. Certified to THX Ultra2 standards, the KEF Ci200RR is engineered with a meticulous understanding of the filmmaking process and surround sound is at the very core of every THX certified 2.1, 5.1 and 7.1 speaker system. Designed with characteristics of professional studio speakers, THX reinvents the tonal balance the filmmaker created in your living room. Consequently, action scenes are full of impact and dialogue-driven moments are natural and alluring. THX certified in-ceiling speakers deliver the correct frequency response and high output and imaging quality of a traditional box speaker to give you the best of both worlds; A THX surround sound performance from mechanisms that blend harmoniously in with any room decor.